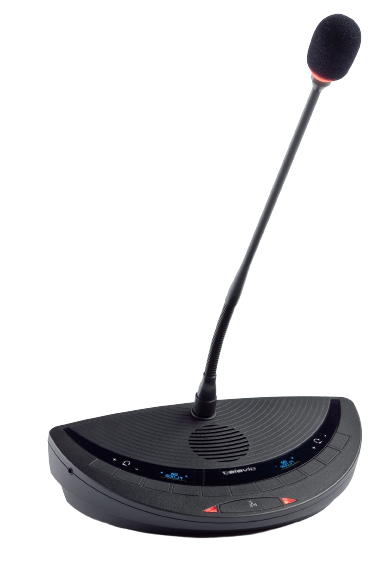 The Televic Confidea wireless conference devices supplied by duvall are comfortable, versatile and extremely flexible to use. As they are not connected to wires, they are perfectly suited to large gatherings or meetings in unusual locations, such as a lunch meeting at a set table. They have a contemporary design and provide a warm, crystal-clear sound without any noise. Their elegant gooseneck microphones are completely impervious to interference, even from mobile phones. Because of their unique multi-band Wi-Fi technology (2.4 GHz and 5 GHz) they are completely reliable: they can transmit across 27 different channels, they automatically select a channel that is available, and automatically switch channels when there is interference on their transmission channel. They adapt to the circumstances, without disrupting existing systems. They have 5 voting buttons and can transmit up to 40 translation channels. The chairperson units have a priority button and a button to give the floor to the next speaker. The removable Li-ion batteries last for over 20 hours, are easy to replace and charge very quickly. 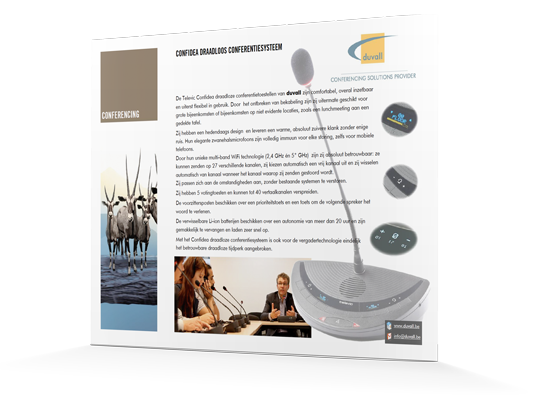 The Confidea wireless conferencing system means that the reliable wireless era has finally started for meeting technology. If you want to use this technology in your meeting, you can rent the wireless conferencing system from duvall.l. Simultaneous translation Headphone socket and distribution of simultaneous translation. Rent this Wireless Conference System? determine the most appropriate set-up for your event.